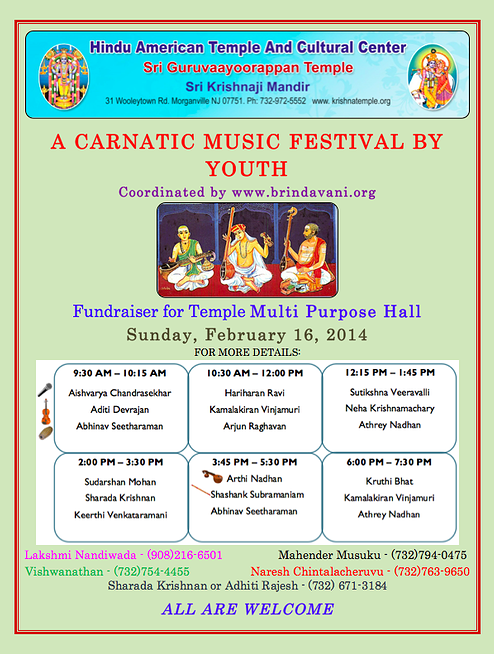 Brindavani held its first annual Youth Carnatic Music Festival on February 16, 2014, at the Guruvaayoorappan Temple, Morganville, NJ to raise funds for its Multi Purpose Hall. The musicians, all high school and college students, were from all over the United States. To learn more about these talented artists, click here. This event was webcasted by iCarnatic.org! Thanks so much to iCarnatic for their support! Our goal was to raise $10,000, but we raised over $15,000! Thank you to everyone that made this event possible. The concerts were incredible!